As we saw in the previous posts in this series, organizations of autonomous teams can scale. Scaling requires different team characteristics (requisite variety, redundancy of function, double-loop learning and minimum critical specification), a different mental model of organization (brain, not machine), a different kind of hierarchy (purpose, not control), and a different style of leadership (guide, not command). This sounds like it would be chaos in practice on a small scale, let alone enterprise scale. And even if it does work, it sounds like a revolutionary approach to organization. Visualizing it helps explain how all these things combine to create an organization that innovates as well as operates. The organization of autonomous teams is not chaos. Teams are invested with authority, communication pathways develop along the hierarchy of purpose, the structure adapts itself to the domain, and organizationally-driven objectives plus team incentives align behaviors and outcomes. Of course, this looks nothing like traditional organization, in which hierarchy is the principal means of control, communication, and alignment. Still, while an organization of autonomous teams may be unfamiliar and conceptually unsettling, it isn't chaos. And, although it may seem revolutionary, it isn't new. Academic research on organizations of autonomous work teams dates to the 1950s, and the early adopters of it were industrial firms. While it may be a way of working that a lot of tech companies happen to adopt for themselves, it is not an organizational phenomenon that has sprung out of tech. So it isn't all that revolutionary, either. It may not be chaotic or revolutionary, but it is a big leap from how just about every enterprise functions today. The way they work reflects the board's priority for the company. I've written before that companies are financial phenomenon more than they are operating phenomenon. Executives tasked by their boards to prioritize returning cash to investors will look to maximize cash earnings (EBITDA) and free cash flow. In so doing, those executives create an environment where managers must be more concerned with costs than creativity from operations. Managers, in turn, condition employees and contractors to value activity over learning, output over outcomes, and narrow individual independence over broad group autonomy. In this environment, employees, managers and executives are rewarded for every dollar not spent for output; they will not be rewarded for any dollar spent on learning. With enterprises increasingly feeling the heat from new companies, technologies and products, executives charge managers with extracting more innovations from the business. Managers go about looking at changing ways of working, recognizing that innovation is partially a byproduct of "how" things are done. But as long as the priority of the board is to return cash to investors, the first mission of "how" things are done is to be predictable, because predictability ensures consistent cash flows and consistent cash flows ensure that interest payments, dividends and buybacks can be made while protecting the bond rating. The autonomous team structure is incompatible with predictability. The autonomous team structure is internally consistent (not chaos) and been around for long enough with enough successes (not revolutionary) that it can succeed, even at scale. Pursuing it is ambitious, and operationalizing it is plenty difficult. But success with it has less to do with operationalizing than it does with the tolerance for it in the capital structure in which it operates. Autonomy - that is, abdication of centralized control - is the price of admission for innovation. Innovation at scale requires autonomy at scale. Autonomy at scale requires the board be committed to innovation, not cash returns, as their top priority. It is easy to understand how a small organization of autonomous teams can function. When there are only a few teams, there is a small community, and it is simple for people to communicate with one another in both formal and informal ways. It is not difficult to see how a large organization of largely independent teams can scale. For nearly 60 years, Gore-Tex has shown that devolved authority can work just fine at scale. Autonomy scales at Gore-Tex because there is very little overlap between outerwear and dental floss, and subsequently less coordination. What happens when the business becomes complex, with lots of interdependencies among lots of teams? Dependencies by themselves do not make it difficult to understand how devolved authority can work on a small scale. If there are 4 teams, there are a maximum of 6 communication pathways (n x (n - 1) / 2). Even if there are transitive dependencies, the small size of the community - 4 tech leads, 4 product owners, etc. - makes cross-functional communications relatively easy. But a technology organization of tens of thousands of people will have hundreds of teams - and therefore an extraordinarily large number of communication pathways. Translating a small number of enterprise goals into hundreds of millions of synapses sounds like opacity at best, chaos at worst. There are four things that an organization of autonomous teams needs if it is to scale. The first is an implicit hierarchy, but one of purpose rather than control.1 Traditionally, hierarchy is meant to control activity througyh supervisory responsibility and assigned decision rights: the subordinates in one division take direction from superiors in the same division. If, per the initial blog post in this series, decision rights are devolved, "span of control" does not exist in the organization of autonomous teams. Hierarchy also influences communications. If those "higher up" in the hierarchy use the things produced by those "further down", there is an obvious pattern of communications between producers and consumers. In manufacturing, there might be different teams independently assembling subsystems such as brakes or drivetrains from individual component parts. Each of their subsystems might then be consumed by teams on the line installing them into more comprehensive systems (such as the powertrain), and, ultimately, the finished vehicle itself. This is called a "hierarchy of purpose." The hierarchy is constructed largely around degrees of granularity. Brakes and drivetrains are smaller assemblies that form larger subsystems that contribute to the finished product. A provider of cloud-based infrastructure such as Amazon can organize in the same way: the "finished product" of a cloud instance consists of more "primitive" components of virtual storage, server and network. Each of those subsystems in turn consists of more finely grained primitive components of network protocol communication, CPU, load balancing, and so forth. Creating complex higher-order offerings as composites of lower-level capabilities is the “platform effect” of innovation. It's worth mentioning that enterprise program management has long tried the same structure. It chokes on itself when transitive dependencies that extend several layers deep expose the difference between a boundary in work (a team has exclusive responsibility for producing something used by many other teams) and a boundary in fact (the output is high-touch service, support and maintenance, making those boundaries porous). A primitive component must be consumable in a friction-free manner. This is a logical transition to the second thing the organization of autonomous teams requires, which is practical patterns of communications. The platform effect scales effectively because consumption patterns are the de-facto communication patterns within the organization. In a hierarchy of purpose, the organization does not have hundreds of millions of communication pathways, because the number of consumers is limited. A cloud instance may consume a load-balancing primitive, but it does so through a more coarsely grained "network" intermediary. The autonomous-team collective maintains enterprise cohesiveness by virtue of its communication patterns. To understand how, we have to revisit the devolved decision classes. Appreciations (what should be done) act as the organizational system for managerial decisions (what can be done); managerial decisions function as the instrumentation system for appreciations. Managerial decisions, in turn, act as the organizational system for technical decisions (how will it be done); technical decisions, in turn, act as the instrumentation system for managerial decisions. How this works effectively in practice becomes clear when we look at the characteristics of a single autonomous team that we saw in the last post. The transmission of minimum critical specifications through a hierarchy of purpose limits the noise and confusion. The reception of minimum critical specifications from multiple consumers are interpreted as appreciations through double-loop learning. The relationship of control systems and instrumentation systems of the different decision classes categorizes the information appropriately. The third thing required for an organization of autonomous teams to function at scale is the ability to handle extraordinary patterns of communication. 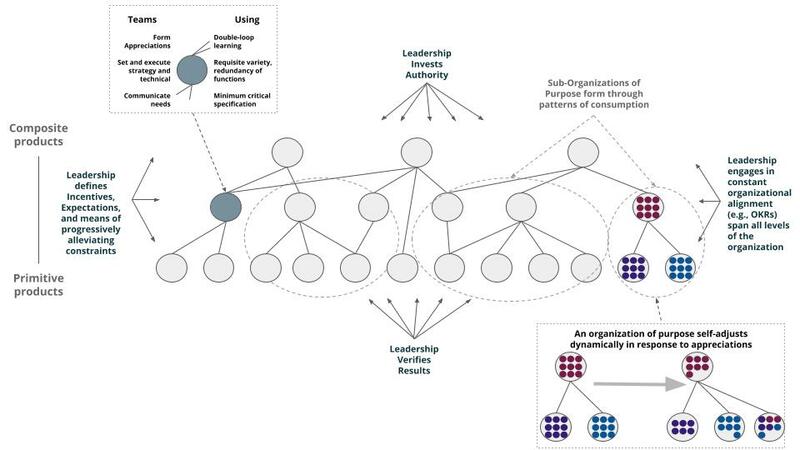 As there is no hierarchy of control, the organization needs protocols that allow it to adapt itself to a changing problem space, as well as to resolve inter-team conflicts. A dynamic problem space is addressed through task-forces, which may be short- or long-lived, depending on the nature of the need or opportunity. Task forces are formed organically from members of affected teams to solve for problems that are existential to any one team. For example, suppose three teams conclude that they need a new class of capability that is outside the boundaries of all of them. They could elect to form a "task force" in the form of a long-lived team, staffed by reassigning members of their respective teams to this new one on a full-time basis. Not all task-forces are long-lived and full-time, of course: a task force to address a simple challenge might require each person commit only 1 day each week for a month, allowing them to otherwise remain focused on their line responsibilities. Another other exceptional form of communication are inter-team conflicts. For example, team A elects not to prioritize something really important to team B, and team B lacks the resources or capability to do it for itself. Without patterns for extraordinary circumstances, it would end with a very grumpy team B. Inter-team conflict is handled through mediation and adjudication protocols. At the first stage of mediation, an acceptable 3rd party - that is, someone who is not a stakeholder in the conflict - is asked to mediate a decision. If the conflict is still not resolved following the initial mediation, a committee of 3rd parties are formed to arbitrate a decision. This provides a fair hearing among peers without the need to resort to authority given through a hierarchy of control. Finally, the organization of autonomous teams needs mechanisms for aligning the strategic goals of the organization with team and individual execution. Appreciations provide connective tissue among strategic, team and individual goals and objectives, but they still need to be reinforced by executive management. Intermediary (layered) objectives have a tendency to change the interpretation of organizational goals, and therefore the goals of each individual. Alignment is achieved by telegraphing executive intent throughout the organization. There are techniques popularized by a number of firms - OKRs, V2MOM, and the Big Bets Spreadsheet - and probably many others. Whatever the mechanism, their purpose is to communicate unambiguous goals to give each individual a clear means of reconciling a decision - why, what and how - with an outcome that advances the organizational goals. This creates direct line-of-sight between effort and result - and therefore tactical action with strategic outcome - and allows the organization of autonomous teams to function without an excessive number of people in low-value supervisory roles. With the right set of characteristics, then, an organization of autonomous teams can reach scale, even in complex environments. But it clearly has a vastly different operating model to the traditional control style imposed over the machine-like organization. Is the labor force equipped for this? Is leadership? We will look at these questions in the next post. 1 Susman, Gerald. Autonomy at Work: A Sociotechnical Analysis of Participative Management Prager Publishers, 1976. 2 There is no guarantee of control, of course. An individual team can still thrash or produce unwanted product. Last month we defined autonomy by the classes of decisions that are devolved to the team level, specifically that the smallest organizational unit - a team - has the ability to decide what it should do, can do, and will do. Looking at it this way makes clear the sharp differences between autocratic and autonomous management philosophies. It also helps us to understand that there need to be very special conditions for autonomy to succeed, even on a small scale. It seems plausible that autonomy can work among a small group of people having a natural predisposition to collaborate and low asymmetry in their depth of skills and knowledge. But there has to be more to it than just a handful of similarly talented and like-minded people working together. If there isn't, than successful autonomous teams are largely an accident of hiring, and not a replicable phenomenon. According to Morgan, there are four things that characterize an autonomous team. By comparison, a team of specialists can be an autonomous unit when the external environment is stable, but it cannot sustain autonomy in the face of changing conditions because specialists lack the ability to adapt. When a specialized skill becomes unnecessary, the specialist becomes redundant along with it. A revolving door of members destroys the cohesiveness of a team. The team of specialists therefore lacks the capacity to self-organize because its members cannot change their job to reflect the changing patterns of demand, and because each member is invested in their skillset more than the team itself. Fixing problems within a team of specialists must be initiated and controlled by higher authority that exists outside the team. In dynamic external conditions, a team of specialists is doomed because the whole will always be less than the sum of its parts, while a team of generalists will acquire the skills and knowledge it needs to solve whatever the problem at hand may be. Another characteristic of autonomous teams is requisite variety. A team's internal capabilities must mirror the breadth and depth of the environment within which it functions if it is to deal with challenges and opportunities posed by the environment. That skill variety must exist within the team itself so that it can be directly applied where and when it is needed. Satisfying requisite variety is where technology platforms enable autonomous teams. While it is true that it is people and not assets who innovate, the assets can enable or prohibit such innovation. Teams that can consume components produced by others in a self-service manner do not suffer a dependency. The more comprehensive the components available for consumption, the greater the requisite variety a consuming team can possess, the larger and more complex the environment a single team can engage. There is more to requisite variety than just skills and capabilities. It also makes a case for human diversity within a team. The appreciations a team develops are richer and more nuanced when they are recognized and crystalized through the diversity of its participants. Another way to look at it is, a homogeneous team will develop homogeneous solutions, and through a lack of human diversity will be structurally blinded to both opportunity and threat. By way of example, I once worked with a bank that was slow to realize that the average age of their employee matched the average age of their customer, that the average had been steadily rising for many years and was now well above the national population average. Year-on-year growth of assets under management looked spectacularly good, primarily because wealth distribution overwhelmingly favored the baby boomer generation. Unfortunately, it completely masked a dearth of new customer acquisition. Along the way, they had become generationally tone deaf, failing to develop experiences and products that appealed to younger generations and subsequently grow their customer base. The next characteristic of autonomous teams is minimum critical specification. Vague charters and ambiguous boundaries create the capacity for self-organization because they build-in the expectation that teams are responsible for self-definition. A team cannot rely on management edicts that tell them what to do and how to do it. A team must instead define itself through practice and inquiry. General guidelines give a team an abstraction that they must constantly solve for, bringing them face-to-face with the appreciations, or "why" they do or do not do something. Telling a team precisely what to do robs it of the capacity for self-determination and self-organization because it locks them into a swim lane. A team that is precisely chartered is institutionally specialized. We saw earlier that a team loses adaptability when its individual members lack redundancy of function. In a similar fashion, an organization loses adaptability when individual teams lack minimum critical specification, because teams themselves are stripped of their capacity to adapt based on what they see on the line. Finally, a team must be capable of learning how to learn. This is also known as double-loop learning. Single-loop learning is the ability to detect and correct deviations from the norm, responding to threats to contain and minimize the impact of exceptions. In double-loop learning, a team is able to analyze a situation in its totality and question the relevance of the things that it does as well as the need to do things it is not doing. Single-loop learning is concerned with staying on-course. Double-loop learning is concerned with determining whether a team is doing what it should be doing in the first place. A well-functioning Agile retrospective is an example of double-loop learning. Both minimum critical specification and learning how to learn point to the need for abstract thinkers, people who can understand a situation and adjust accordingly. Large ex-growth enterprises are operating companies, not developing companies. Operating companies need efficient execution, so they are populated with concrete thinkers, people who are conditioned through incentives and rewards and professional certifications to keep the ship sailing "steady as she goes". Abstract thinkers are constantly questioning why and looking for the right course of action based on all available information. To the concrete thinker, an exception is a problem to be contained. To the abstract thinker an exception is an opportunity to learn. These four characteristics - redundancy of function, requisite variety, minimum critical specification and learning how to learn - make it possible for a team to self-organize, self-direct and self-regulate in response to changing external conditions. It is not difficult to see how these form the core characteristics of autonomy. It is also not difficult to see how their respective antitheses - specialization, dependency, precise chartering and single-loop learning - are the defining characteristics of the sclerotic organization. Combined, these characteristics create what Susman4 calls "learning cells" within an enterprise. While they form the basis of the autonomous team, a cell does not simply multiply to form a more complex organization. We’ll next look at what it takes to scale the learning organization. 1 Morgan, Gareth. Images of Organization Sage Publications, 1986. 3 If "does not have" is institutionalized as "can not have" through shared services - for example, because of an acute shortage of supply, or because those functions are used as control mechanisms to "protect production" - then the pretense of "autonomy" is a veneer over the management anti-pattern of "responsibility without authority". 4 Susman, Gerald. Autonomy at Work: A Sociotechnical Analysis of Participative Management Prager Publishers, 1976. Firms in industries ranging from financial services to retail pharmacy to fast food aspire to be "platform companies." In the minds of their chief executives, the emergence of Amazon and the evident superiority of platform economics make this necessary for their continued survival. It is also a good story to tell Wall Street as it allows a firm to create the aura of being the technology leader in their space while trafficking in the success of companies like Amazon. "Platform" is conceptually conveyed as a technological phenomenon. But it stands to reason that the defining characteristic of the platform organization is neither the technology assets that they produce (e.g., friction-free consumable primitives), nor how they produce them (e.g., lean and agile process). The benefits of a platform are only yielded if the creativity and imagination of the rank and file can be unleashed through those assets, to experiment, learn, and implement quickly. This means devolving decision rights far down into the organization, a.k.a. autonomous teams. In general, the longer the time period required for the consequences of strategic decisions to be realized and evaluated, the less flexible are resources for commitment to alternative objectives. Furthermore, (1) the longer the time period in which strategic decisions operate as constraints on the decisions made by technical-level personnel and (2) the lower the complexity of the tasks required to carry out operational plans, the more likely that operational planning will take place at a higher level. The first sentence neatly captures why things like Agile and Continuous Delivery and Lean Startup are so appealing. We reach critical mass of feedback on a strategic imperative - and therefore judgment on the wisdom of that imperative - more quickly with lots of frequent deliveries of small but business-valuable things than we do with infrequent, large deliveries of comprehensive business solutions. The sooner we reach the inflection point where a body of feedback confirms or contradicts a strategic decision, the more quickly we can move on to the next phase of our strategy, or change course. This separates the sclerotic laggards from the adaptive innovators. In addition, the presence of continuous market intelligence serves to separate the agile and adaptive from the strategic flailers. This is intuitively obvious, but seeing it in black and white serves as a means test for the fulfillment of business strategy: is a firm asserting, confirming, or just guessing at what the market will buy? The second part of the paragraph helps us to better understand the organizational dynamics within a small and innovative company versus those within a large integrated program team or an enterprise. The first part is simple enough: the longer it takes to realize a strategic imperative... Longer is bad, check; already established in the first sentence. The second part is where it becomes interesting: and, the simpler the tasks required to deliver that strategic imperative... This statement is an indictment of the labor carrying out those tasks and the management defining them. All together, the second sentence tells us that a long-lived initiative expected to be fulfilled through simple tasks relegates executives to the role of supervisor. This is a damning statement in a number of ways. The moniker "executive" is highly relative, potentially to a point of meaninglessness. The greater the degree to which technical execution is decomposed into simple tasks, the higher up the responsibility for operational planning. The higher up the responsibility for operational planning, the less meaningful the title of the person doing that planning. C-levels engaged in day-to-day prioritization and resource allocation are not executives. They are mid-level managers who have benefited from title inflation. It also means that the scope of executive decision-making - strategy - is concentrated in just a few hands. This renders quite a few people executives in title only, and deprives a company of its next generation of leadership by stifling their formation. Anyone touting the potential for innovation from a delivery team engaged in task execution is living in a world of make-believe. Innovation stems from the combination of autonomy and complexity: give a team the freedom to solve a complex problem any way they see fit, and they are likely to come up with something novel. A system based on completion of simple tasks deprives a team of any complexity to sink their teeth into. Additionally, a system of rudimentary task completion is inherently a control system, which has zero tolerance for independent thought or action that is off-plan. Innovation is scarce where control is the priority. Enterprise-y Agile processes function as systems of control, not innovation. Any system that adjusts the work to suit the labor instead of adjusting the labor to suit the work will require a high degree of centralized control. Enterprise Agile processes tolerate, and even advocate, decomposing work into tasks and assigning them to specialist labor. This values the control of labor over the creativity of labor. Per the previous point, technical-level employees are systemically disenfranchised. A system based on control through tasks offers no leeway for devolved decision rights; the only right an individual has is to complete the tasks they've been told to complete. This makes enterprise Agile processes more prone to suppressing than unleashing innovation. The dynamics of small teams in small companies are not directly transferable to small teams in large enterprises. Small teams in small companies have high degrees of overlapping responsibility, little tolerance for specialization, light processes, and engage in high-bandwidth, omni-directional communication. Large organizations codify things such as roles and responsibilities, career development, processes, and work (e.g., technology) guidelines, and engage in low-bandwidth, hierarchical communications. In small companies, trust is largely based on the expectation that everybody will do whatever it takes to achieve a common outcome; in large companies, trust is largely based on the expectation that specialized people respond to precise requests with precise responses. Team dynamics are functions of HR structures, organizational values and systems, communication patterns, and ingrained behavior patterns, all of which are highly resistant and even subersive to change when they have decades to develop within a company. The executive in a legacy enterprise who says they want to transform the company into a "start-up" betrays their naïveté of the magnitude - and unlikeliness - of that task. The paragraph at the beginning of this post captures what many in the tech biz have experienced for decades. Since the 1990s, enterprise IT has been a story of scale. As it scaled, it became more prominent on the income statement, and was forced to place a premium on control. Occasionally, it basks in the reflected glory of innovative consumer technology firms, or gets elevated by a CEO as a source of untapped potential. Unfortunately, enterprise IT has never been able to reconcile an expectation for innovation with the fact an over-emphasis on control gives everybody in management a demotion, suppresses innovation, and stifles attempts at organizational renewal, all while holding a company back from fulfilling its strategic potential because it takes such a long time to get anything done. The most interesting thing about that paragraph? It was first published in 1976. Industrial, not tech firms, were the prominent companies of the time. The lessons remain the same.